When using a supercharger or a big cam, chances are there's not enough vacuum being generated to operate power brakes. At least 16" of vacuum is needed to properly run a power brake booster. Our new vacuum pump kit will provide the proper amount of vacuum. 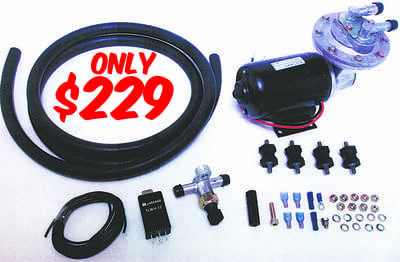 Kit includes 12 volt vacuum pump, switching relay, vacuum line and control, mounting insulators and hardware.